To connect to your MegaSquirt you need a way of connecting to the MegaSquirt’s serial port via a Bluetooth or WiFi connection. Details of suitable modules are detailed here. Alternatively you may create a suitable link using a PC or similar connected to the MegaSquirt via a serial port. A suitable application for Mac users is available to download courtesy of Christian Egger. This allows your iPhone/iPad/iPod to connect to your MegaSquirt via a USB serial port connected to your Mac. Note that it uses port 2000. You can download the application from here. 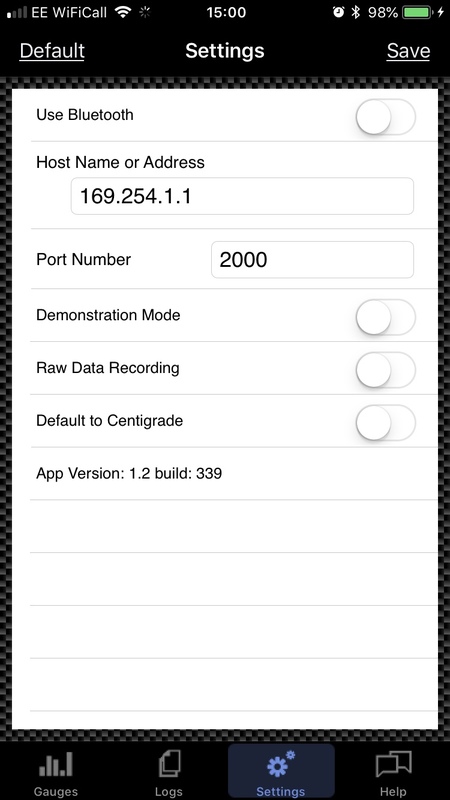 The connection details for your solution can be entered in the “Settings” tab of the MobiSquirt app where for WiFi you can supply the IP address/hostname and the port to connect to. The default settings, as shown on the left, are designed to work with a WiFly (RN-134) module in its default configuration. Pressing the “Default” button will reload these settings, remember to tap “Save” to activate your new settings. Switching “Use Bluetooth” on will display, instead of the WiFi settings, a list of compatible Bluetooth connections. Tap on the device you wish to use and the app will attempt to connect to it. Successful connection is shown by a tick mark next to the device name. Demonstration mode overrides the settings you’ve entered and, instead, the app will attempt to connect to a demonstration server on the internet. 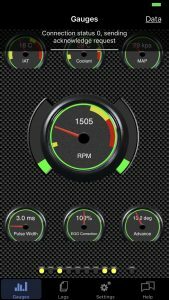 Currently the available server simulates an MS1-Extra device and uses a raw data file from a live logging session so the app will connect and behave pretty much as it would when connecting to your ECU. NOTE that demonstration mode can, in theory run over a 3G connection however in practice a WiFi connection is really required for the demonstration mode to work effectively. 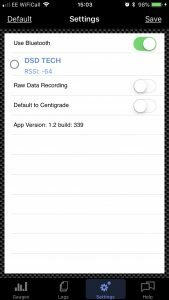 The “Raw Data Recording” option is intended for debugging any problems once a connection has been established and should be left switched off unless you are submitting data for error diagnosis. For WiFi connection, don’t forget to go into your iPhone/iPad settings panel and choose the appropriate WiFi settings for your selected connection method. In the case of the WiFly modules your module should appear with a network name something like “Wifly-GSX-00”. The current connection status is shown on the top of the realtime gauges view in the form of a progress bar and some descriptive text. 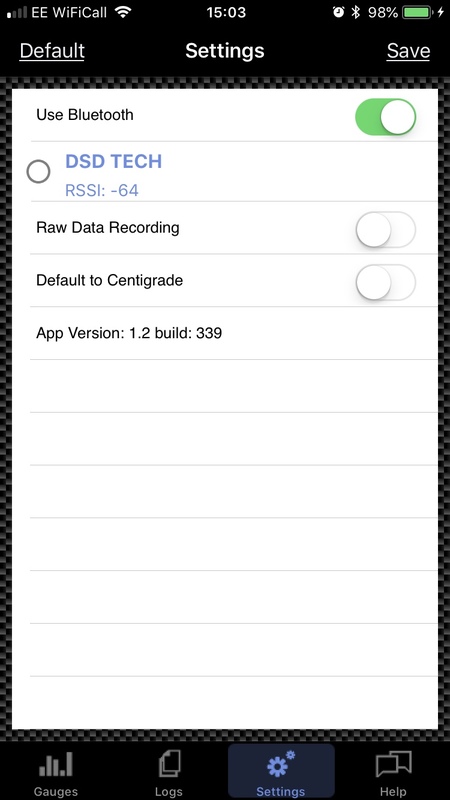 As the connection is established the progress bar will fill as the app interrogates and receives configuration information from your MegaSquirt. 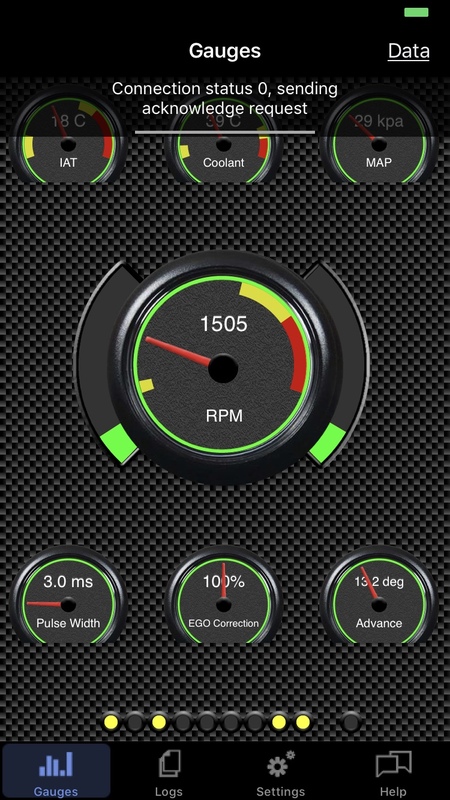 Once your connection is fully established the status panel will be hidden and the gauges will respond and start to show the realtime data being received from your MegaSquirt. Moving to the data view when the app hasn’t established a connection will show a diagnostic log with constant updates to the app’s progress.